Yep, my is the operative word here. I now own a Fat Tire(d) bicycle – it is in the kitchen addition. I have owned about a dozen bicycles in my adult life – and each and every one of them has spent their first night in the house. Early on, I kept these bicycles in my bedroom. It would be difficult, doing this here because the stairs are so steep. I’ve always considered bicycles to be a cheap substitute for a horse. Now that I have horses, it is what it is, a bicycle. We live adjacent to the Matanuska Moose Range Trail system – it’s practically outside our door. It’s been discovered by snowmobilers and ATVs and bicyclists. The bicycling contingent now grooms it for riding. 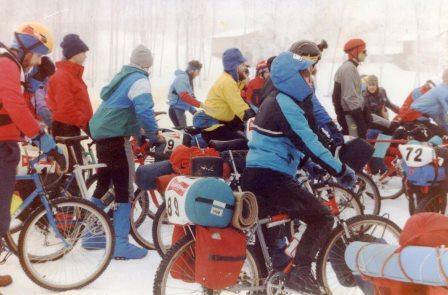 And since the advent of it fat tired bicycles, it is possible to trail ride on icy/snowy trails. I was faced with a choice. I could continue to ride my horses on these trails, or I could get a bicycle and ride it and horses on these trails. I chose the latter because I have had this great desire to go further afield in the winter. A tough call because this IS going to take some time away from horse travel. But then again, if I get out often, I will get in better shape, which will make me a better horseback rider. I also have plans to ride and take Tyra and Ryder with me once I get the hang of riding “Hestar,” the iron horse. Today, before heading to town, I rode Raudi and ponied Tinni. I rode without stirrups. I had a wonderful ride. It was about 0° F out, overcast, snowing just a bit. Raudi maintained a perfect pace and Tinni followed suit. I rode all our loops. It could not have gone better. I have to say that I managed my time well – first doing my body awareness work and then getting outside right after. Pete and I spent the entire afternoon at the Palmer bicycle shop. Brandon and Kevin, spent a LOT of time with us – answering questions and just talking. If I was way younger, I would have had a crush on these two guys – they are both fit and extremely articulate. But I am now much older – with my hair unbrushed I looked like a deranged older woman. If I wasn’t purchasing a bicycle, I would have been invisible. Pete went with me on a test ride. 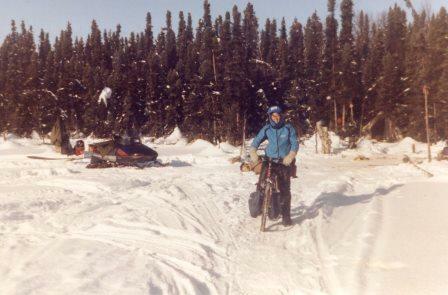 He rode his mountain bicycle with the new studded tires. We went on a trail paralleling the side road; I floated over the snowy trail and Pete got bogged down. So we went back and got a test bicycle for him to ride. Had Pete said that he wanted a bicycle, I would have foregone getting one – I’m just that way. I feel okay now, but I have to admit that I am not at all in bicycling shape. I will get in shape because I have aspirations. I’d like to do a combination bicycle/horse trip this summer. And I’d like to do a long distance trip next winter. We’ll see. First, I must figure out, time-wise, how I am both going to get a ride in and horses out. Gosh, I lead a tough life.